Golden, BC, Canada is located in the beautiful Columbia River Valley. The community is the centre of Kicking Horse Country on the banks of the Kicking Horse and Columbia Rivers in the east Kootenay Region of British Columbia, Canada. The Purcell and Selkirk Mountains; the two mighty rivers and six major wilderness parks are all neighbours to the adventure playground referred to as Golden, British Columbia, Canada. The mountains, parks, lakes, rivers and the wildlife in the region provides a remote and rough landscape creating an active adventure and sightseeing environment.During the summer travelers enjoy adventures like mountain biking, rafting, camping, hiking, backpacking, river kayaking, swimming, horseback riding and more. During the winter snow and ice season the activities mostly enjoyed include downhill skiing, snowboarding, cat skiing, heli skiing, xc skiing, snowmobiling, snowshoeing, ice climbing and ice fishing. Many of the summer and winter adventures can be enjoyed in or near the six major wilderness parks in the area - Glacier and Yoho and Mount Revelstoke National Parks being the closes to Golden. Closer to the community the Gorman Lake Trail and the Thompson Falls Trail are popular day exploring destinations. The best walk or bike in town is on the Rotary Loop Trail. The loop trail is a sightseeing route leading to a wooden foot bridge crossing the mighty Kicking Horse River. The services in Golden which are important to travelers include accommodations, tours, guides, coffee shops, grocery store, restaurants, pubs, liquor stores, gas stations, internet, cell service and taxi services. 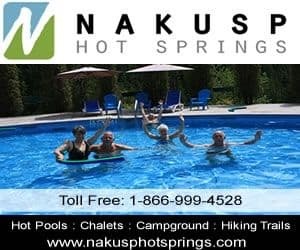 Book your accommodation, adventure and attraction in Golden, BC, Canada. eh! Plan to Visit Golden, BC today.